Annie Giles Hobbs uses layers of handmade papers. They function not merely as surfaces, but are constituted and shaped for her predetermined images. The density of these large pieces is impressed by multi-plate etching, collograph and monoprint, whose qualities build up a richly worked top surface, whilst partially revealing texture and imagery at the edges of receding layers. Close inspection discloses a structural linearity ranging from the fine delicacy of a Lippi to some expressionistically agitated networks in tonal areas. On more distant viewing the forma of figures and symbolic references coalesce from the overall schema in palely luminous flesh tones. 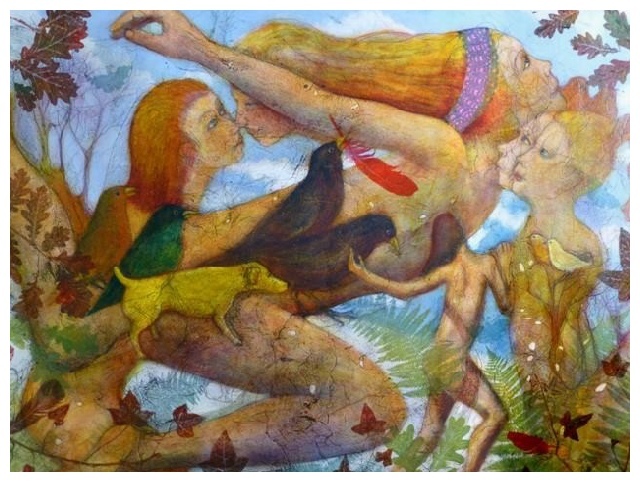 The dreamlike quality of fading and re-emerging configurations conveying sensual and soulful experience, implies to the viewer distances of history and age-old myth in these tentatively expressed relations, giving contemporary insight into the archaic and mystical bond between humans and the animal world. Welcome to Annie Giles Hobbs website showing past and present work, while keeping you informed of future exhibitions and events.